MRS. Mildred Dingley did, this Day, take the Oaths of Allegiance and Supremacy, in order to her being naturalized. Resolved, &c. That the Name of Mrs. Mildred Dingley, be added to the Bill of Naturalization: And that the Amendments, sent from the Lords, having been twice read, be agreed, with the Addition of her Name. Sir John Birkenhead reports from the Committee to which the Bill for ascertaining the Measure, and setting a Price on Coals, was committed, some Amendments agreed by the Committee to be made to the Bill: Which he read, with the Coherence, in his Place; and after, delivered the same in at the Clerk's Table: Which Amendments were twice read; and, upon the Question, agreed to. Resolved, &c. That the said Bill, with the Amendments agreed to, be ingrossed. An ingrossed Bill, sent from the Lords, for Repealing of Part of an Act directing the Prosecuting of such as are accountable for Prize Goods, was read the Third time. Resolved, &c. That these Words, "or Exchequer," be added by way of Amendment to the Bill. Resolved, &c. That the Bill, with the Amendments, do pass: And that the Title be agreed to. 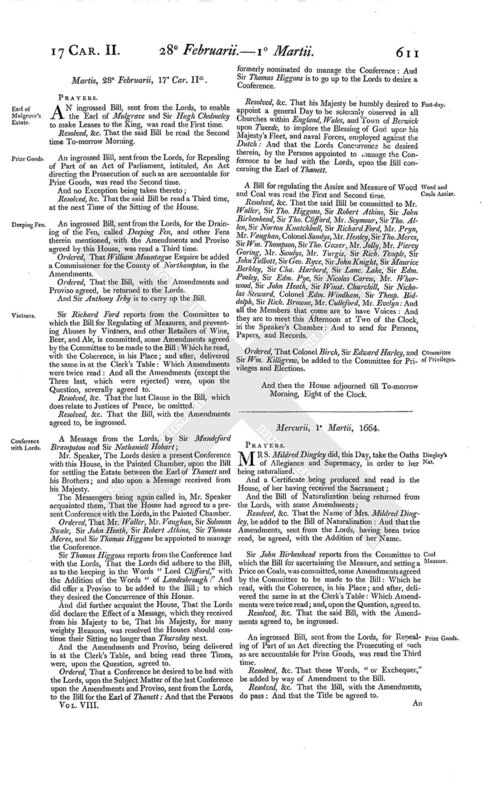 An ingrossed Bill, sent from the Lords to enable the Earl of Mulgrave and Sir Hugh Cholmeley to make Leases to his Majesty, was read the Second time. An ingrossed Bill to prevent Abuses in Retailers of Wine, Beer, and Ale, and other Liquors, was read a Third time. Ordered, That the Report concerning the Election for the Town of St. Ives be heard To-morrow Morning at Ten of the Clock. And have also commanded us to acquaint you, That they agreed to these Bills following; viz. The Bill for regulating the Press; The Bill to enable the Chancellor of the Duchy to enable Commissioners to take Affidavits in the Country; To the Amendments, sent from this House, to the Bill for making the River Medway navigable; To the Amendments to the Bill for draining the Fen, called Deeping Fen, and other Fens therein mentioned; and To the Amendments to the Bill for enabling the Lord Henry Powlett, and others, to sell the Manor of Abbotts Anne; and also To the additional Bill for ordering the Excise. Ordered, That the Persons formerly nominated do manage the Conference with the Lords. Mr. Speaker, The Lords do agree with this House upon the Subject Matter of the last Conference; and have appointed Three Lords to attend his Majesty with the Message to be sent for a general Day to implore the Blessing of God upon his Majesty's Fleet, and naval Forces, against the Dutch; and desire this House would appoint a double Number of their Members to join with the Lords: And have sent the Lord Chamberlain to his Majesty, to know his Pleasure, When he will be attended. Ordered, That Mr. Pryn, Lord Ancram, Mr. Edw. Seymour, Sir John Birkenhead, Mr. Progers, and Sir Thomas Clifford, be appointed to join with the Lords, to attend his Majesty. The Amendments, sent from the Lords, for restoring Sir Charles Stanley in Blood, were twice read; and, upon the Question, agreed to. Ordered, That the Bill, with the Amendments, be returned back to the Lords. And the Lord Ancram is to carry them up. And then the House adjourned till Three of the Clock in the Afternoon. AN ingrossed Bill for regulating the Measure and Prices of Coal, was read. And several Amendments were, upon the Question, agreed and made to the Bill, at the Table. And a Proviso was tendered: And, being twice read, was, with some Amendments, agreed to be added, and made Part of the Bill. Resolved, &c. That the Bill do pass: And that the Title shall be, An Act for the regulating the Selling of Sea Coals by Retale. 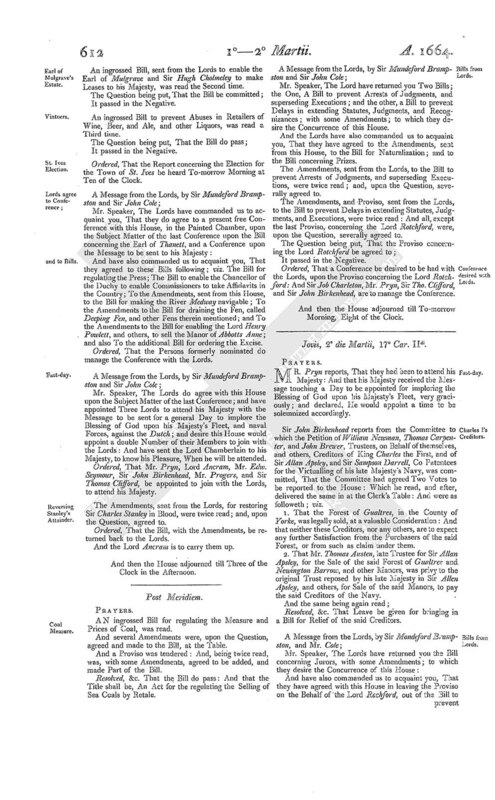 Mr. Speaker, The Lord have returned you Two Bills; the One, A Bill to prevent Arrests of Judgments, and superseding Executions; and the other, a Bill to prevent Delays in extending Statutes, Judgments, and Recognizances; with some Amendments; to which they desire the Concurrence of this House. And the Lords have also commanded us to acquaint you, That they have agreed to the Amendments, sent from this House, to the Bill for Naturalization; and to the Bill concerning Prizes. The Amendments, sent from the Lords, to the Bill to prevent Arrests of Judgments, and superseding Executions, were twice read; and, upon the Question, severally agreed to. The Amendments, and Proviso, sent from the Lords, to the Bill to prevent Delays in extending Statues, Judgments, and Executions, were twice read: And all, except the last Proviso, concerning the Lord Rotchford, were, upon the Question, severally agreed to. Ordered, That a Conference be desired to be had with the Lords, upon the Proviso concerning the Lord Rotchford: And Sir Job Charleton, Mr. Pryn, Sir Tho. Clifford, and Sir John Birkenhead, are to manage the Conference.